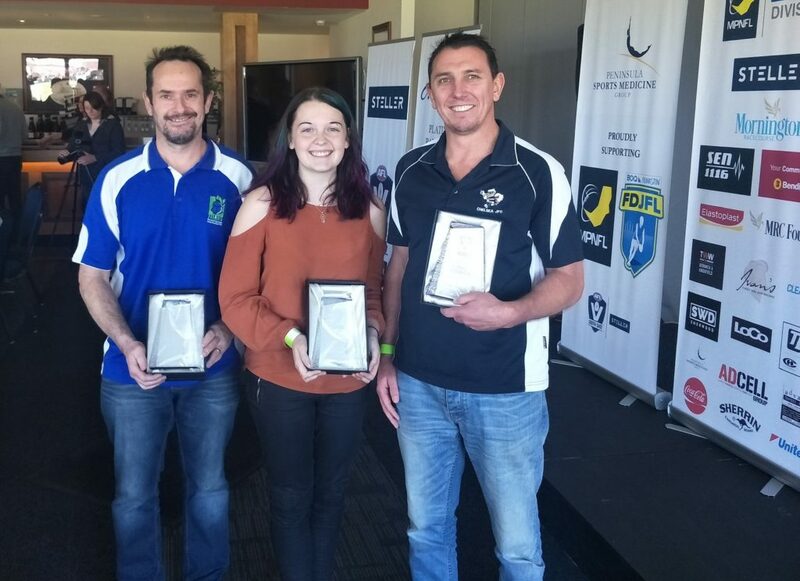 018 AFL South East Coach of the Year Award winners, from left; Len Fletcher (Berwick Springs JFC), Cassie Rowe (Pearcedale JFC) and Heath Donnellan (Chelsea JFC). Absent; Paul Goonan (Mt Eliza FC) and Jamie Mollo (Red Hill FC). The classic MPNFL Division One Grand Final wasn’t the only contest fought out at Frankston Park on Sunday with winners announced for the 2018 AFL South East Coaches Awards. Announced at a Grand Final Luncheon hosted by Peter Lazer, the awards were presented by North Melbourne premiership player and former St Kilda coach Stan Alves. Winners were announced in five categories – Junior, Youth, Female, Rookie, and Senior – with Junior and Female Coaches of the Year, Heath Donnellan from Chelsea, and Cassie Rowe from Pearcedale, to represent the region at the upcoming state awards. Auskick awards winners were announced at a function at Karingal Football Netball Club last week. Congratulations to the winners and all nominees for their outstanding coaching efforts this season.